Mari – Have you ever ridden a cycle in your life? Mari – Do you still ride a cycle? If we reflect upon our life and try to recollect the most cherished moments that we have experienced so far in our journey, we would discover that the majority of these moments were part of our childhood phase. Those indeed were the good old days! And if we dig a bit more into the cherished moments of our childhood, we would, without doubt find that a few of these incidents have a bicycle embedded in it. The cycle and its cousins have a very special relationship with us. They touch and shape every stage of our life. When we are born, a distance relative of the cycle – The Cradle surrounds us with its protection. The Cradle helps us to journey around the world even before our legs take up that responsibility. With the passage of time, we grow out of the cradle and climb on the Tricycle. It is our first independent vehicle. It is we who control where to take it and with what speed to drive it. It is a friend which helps us explore the world, a friend which rides with us through impossible curvy and crooked places, a friend which takes many a falls with us but a friend which always is ready to go wherever our infant imagination wants to take us. As we grow up a bit more, the tricycle becomes a thing of the past and out comes the Bicycle. The Bicycle is a big step in our life. When we dash on our bicycle, it gives us a taste of the speed, which is required by us to move ahead in life. When we fall down from our bicycle, it gives us a taste of the pains that life has to offer. When we complete our first bicycle ride without anyone’s support, it gives us a taste of thrill, freedom and confidence required to live. Then as we grow up even more, we abandon the cycle and its relatives for the more comfortable means of commutation. The Cycle, from being a tool of discovery ends up being just a piece of decoration. And with time, the piece of decoration decays into a piece of debris for us. We abandon the Cycle and throw it out of our house and out of our life. But the cycle, which was our best friend, is not able to come to terms with the fact that we have given up on the friendship. It desperately tries to come back to us, albeit in the form of a exercise equipment in the gym but there also it hardly gets any extended attention from us. With time the Cycle realizes that it is not wanted anymore. It then waits patiently and watches us live our life. It watches and sees that the day has come when life has caught up with us, it sees the day has come when our limbs have began begin to fail us. 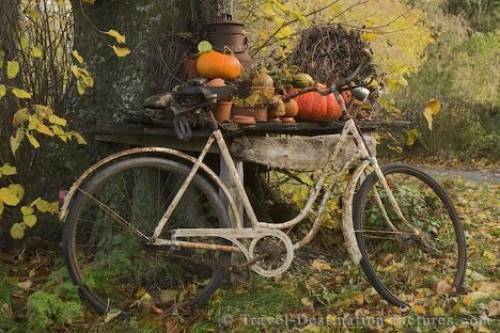 At this lonely stage of our life, when not many people want to talk to us, we can but only sit down and reflect on our past days and realize that one friend is still waiting for us in the junkyard outside the house – Our old Bicycle. But alas, when we could, we deserted it .Now, even though we want to, we cannot cycle anymore. Our body no longer has the strength to do so .We can only think about the time when we cycled and take pleasure in the vicarious thrills. Our eternal buddy, the Cycle realizes our state. It stays aloof, as it is angry with us for we deserted it for years together. But eventually , for the sake of friendship it decides to come back to us and free us of our loneliness and helplessness — The Wheel Chair helps us to journey around the world even after our legs have given up that responsibility. Mari – Would you ride it in the future? 100% True. Nice article well written. Sad that people tend to forget what they once considered a valuable and cherished possession.